Goldenrod vs. ragweed: Which causes allergies and which benefits pollinators? A field of showy golden flowers is a common site in late summer, but is goldenrod to blame for our allergies? Each year, we get questions about whether goldenrod is contributing to our late-summer allergies. The short answer: Most likely not, it's actually ragweed that's to blame. Don't miss Bao Phi — two-time Minnesota Grand Slam champion and National Poetry Slam finalist — as he shares his poetry and connection to our Big River at our signature annual event, "An Evening Celebrating the River," September 20 in downtown Minneapolis. The contrasting colors or purple blazing star and yellow goldenrod are eye-candy for both humans and bees. You can now visit these colorful, water quality-themed mural at Como Lake! This mural is the second design by community members to decorate Como Lake's shores. Ever wondered why so many metro lakes turn green in the summer? For St. Paul's Lake Como and many others, one main reason is nutrients that come from neighborhood lawns and streets. After it rains, fertilizer, leaves and grass clippings are directed into our local lakes, creeks and rivers via storm drains, in turn feeding algae and excessive plant growth. 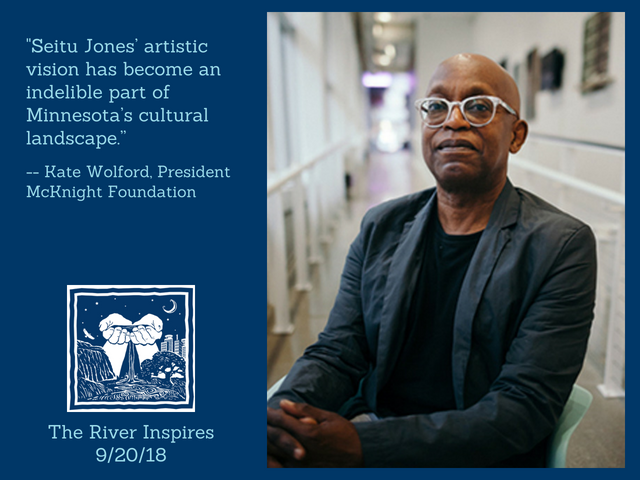 FMR is pleased to announce that Seitu Jones will be the keynote storyteller at our signature annual event, "An Evening Celebrating the River," September 20 in downtown Minneapolis. In his five-decade career, Jones has been a fixture of the Twin Cities’ art, environmental, agricultural and water communities. This spring, we kept a close eye on our habitat restoration projects to see if they're paying off for wildlife. If our sightings are any indication, we’re certainly on the right track!